Pauri District is well connected with road. The Tehri- Moradbad State highway connects the major destinations of Pauri district like Kotdwar, Lansdowne, Pauri, Srinagar etc. Accessibility conditions are very nice with Railhead at each entry points like Kotdwar, Rishikesh, Hardwar & Ramnagar. Regular buses, taxi’s, car rentals runs from these places to all parts of the districts and adjoining areas. Scheduled Roadways, GMOUL, KMOUL and other private buses are available from here. Nearest Airport is Jollygrant (Dehradun) which is around 155 km from the district HQ. A newly constructed bridge at Devprayag over the confluence of river Alaknanda and Bhagirathi had cut short the accessibility of Pauri via Rishikesh by 18 km. 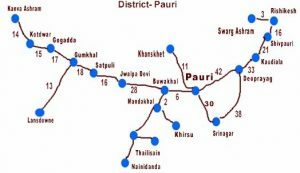 Road : Pauri is well connected to Dehradun, Rishikesh, Hardwar, Kotdwar and other cities of the region.